The fact that you are reading this, you must be seeking for your loved one a Dementia-specific Care Centre. It wasn’t too long ago that I was probably in the same situation as you. At the time my mother was diagnosed with Dementia and early signs of Alzheimers, I had so little knowledge and totally underestimated the complexities in caring for a person with Dementia. It was hard. I have to admit. Despite having both a dedicated maid and private nurse at home to take care of her, they only catered to the physical aspect of watching over and feeding Mum. None of us had the experience to cater for her mental, emotional and social needs as a person suffering from Dementia. I still had to rush home from work when I received phone calls when they could not cope with Mum’s irrational behaviors. With the need to hold a job, the inability of us, the caregivers to cope, and my once brilliant and efficient mother not understanding basic logic, I was under high stress, absolutely frustrated, depressed and felt I was going crazy. Like you, I started looking for a specialized Dementia daycare for her and respite for me. I visited many day care centres/ nursing homes in Klang Valley. I didn’t find any that provided a clean, bright, homely environment, where she is engaged with activities and other social interactions; not sitting staring into a television in a dingy room smelling of a mixture of urine and antiseptic, together with a large group of similarly vacant-eyed elders, with only one or two harried caregivers to take care of all their needs. I began to read voraciously on Alzheimers to understand Mum’s fluctuating behaviour, how my family could give her the best possible care and quality life, and at the same time, what we, the caregivers needed as well to cope. 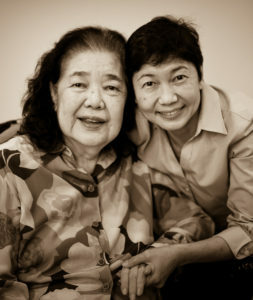 As part of my search for Mum, my co-founder and I attended talks and courses provide by Alzheimers Organisations plus made educational visits to centres in Singapore and Australia. When we stepped into those centres, we knew their approach and care environment was what we wanted for our mothers, as well as your loved ones, which is currently not available in Malaysia. As a result of that, we resolved to open a Centre providing Enrichment Programs, not just a daycare to “keep watch over” our loved ones. I have been practicing the Person-centred Enrichment approach with my mother, and there is a difference. She still has challenging moments but now, I also have uplifting moments with her. Whilst by the next day, she may not remember the time I had with her today, it does not matter. The chuckle, the smile of glee that lit up her eyes from an activity she can participate in, is all worth it. The enrichment activities offer moments to be engaged, and this a precious relief to a person who is not fully cognizant anymore. I know what you are going through. I went through that. By setting up the Dementia Enrichment Program Centre, I hope we can share this journey with you, a similar memorable moment, and also a brief moment of respite for you the caregiver. Keep your spirits up, there is help within reach.